The MINI is a revolutionary design, the original "console pc", and the inspiration for an entire genre of ITX cases. Working in a tiny space with ribbon cables and DC-DC power supplies can seem daunting, but a little guidance transforms the process into something that is simple and fun. Follow these example configurations to quickly get started building your own MINI! There is a reason this build is the most popular with MINI enthusiasts. The Zotac 1080 Mini or MSI 1070 Aero ITX provide excellent graphics horsepower for no compromise 2560x1440 gaming while remaining fairly cool and quiet. Choose the 1070 for an even quieter out-of-the box experience. 2060 and 2070 GPU from certain MNFs can allow for “Brickless” variants! The GeForce 2060 6GB is a NFC personal favorite. It does a great job balancing high resolution gaming performance with efficiency. Under load it sips power, allowing it to remain cool and quiet and be powered by a plug-in DC-DC unit like the new HDPLEX 200DC. This saves money and reduces wiring complexity making for a neat build. The 1050ti is a solid performer at 1080p in AAA games and with a few compromises can drive high resolution monitors with smooth frame rates. What makes it interesting is its extreme efficiency which allows it to be powered off the PCIE bus. 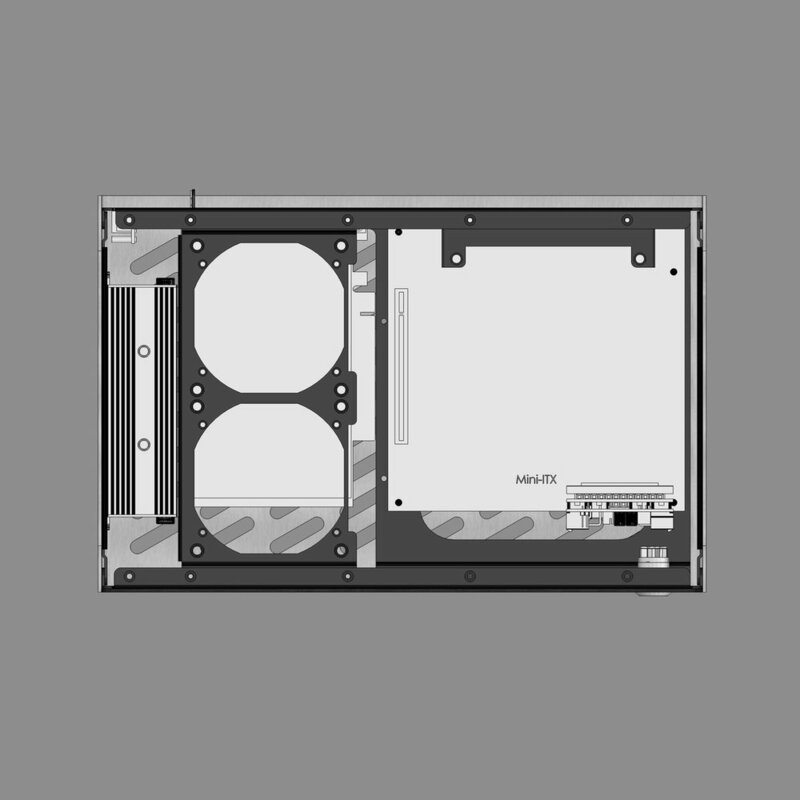 Its compact size and low TDP make room for a small power supply to be installed internally. This "brickless" MINI is powerful, silent, elegant, and extremely portable--perhaps the finest example of small form factor computing. Plug and play with a C8 connector kit, otherwise some simple soldering needed. If complexity, noise, heat, and cost are secondary to performance, then this is the configuration for you. Difficult to build and a brutish desk companion, but there is nothing that can compare in size and raw performance of this monster MINI build. This build is only on this list by popular request. NFC does not endorse it due to noise, heat, and complexity. Not plug and play; soldering and advanced tuning required.